With all the opportunities that our great Republic offers to native ability and energy for attaining the highest civic prizes without extraneous assistance or arbitrary distinction, we have produced no more perfect example of a happy result than the career of William McKinley. European critics who are unwilling to see anything good in democracy are fond of repeating certain disparaging assertions concerning American life, activities, and government. They represent us as virtually a plutocracy; but Mr. McKinley never was rich, and never was under the slightest suspicion of using his great office to acquire wealth. They say we are rude and vulgar; but Mr. McKinley was as courteous and as gentle as the most fastidious could wish. They say we are ignorant of all but the most sordid affairs; but he was thoroughly educated, and probably there are not half a dozen statesmen in Europe who know as much of his country as he knew of theirs. They point with a sneer at the divorce laws of some of our States, and infer therefrom the direst things with regard to our domestic life; but Mr. McKinley's devotion to his wife and his home was known and admired of all. Moreover, there is not a sovereign in Europe, though some of them command vast armies, that ever has been within reach of an enemy's guns; but William McKinley carried a musket in the great Civil War, won promotion by merit, and participated in hotter battles than Europe has seen since Waterloo. This man came of Scottish ancestry, the earliest records of the family dating from 1547. The crest of the clan was a mailed hand holding an olive branch, and the motto was "Not too much." William (father of the President) was born in Mercer County, Penn., in 1807, and two years later the family removed to Columbiana County, O., where in 1829 he married Nancy Campbell. Nine children were born of this union, of whom William, Jr., was the seventh. The future President was born in Niles, Trumbull County, O., January 29, 1843. His grandfather and his father were iron manufacturers. His father was a Whig and a Protectionist. The family were Methodists. William McKinley, Jr., was sent to the public school in Niles till 1852, when his father removed to Poland, where he studied at the seminary. He is said to have excelled in mathematics and languages, but was specially noted for his activity and ability in the debating club. Here he was prepared for college, and in 1860 he entered the junior class at Meadville, Penn. But the boy had worked too hard and steadily, and in a little while he was obliged to give up his studies and seek a change. He taught for a time in a public school, and then became a clerk in the Poland post-office. And here came the turning-point in his life. The irrepressible conflict, foretold by our poets and dreaded by our statesmen, broke out in the spring of 1861. The great Civil War, which lasted four years and cost four hundred lives for every day of its duration, appealed to the young manhood of the country as nothing else ever had; and while it sent many to the grave, and changed all the scheme of life for others, it opened for still others such careers as without it would have been impossible. William McKinley, Jr., then eighteen years of age, was one of the first in his town to enlist for the defence of the Republic. He became a private in the Twenty-third Ohio infantry, and in this he was exceedingly fortunate, as it was one of the best regiments in the service and numbered among its officers several who became famous. William S. Rosecrans was the Colonel, Stanley Matthews the Lieutenant-Colonel, and Rutherford B. Hayes the Major. In the four years of its service that regiment mustered, first and last, 2,095 men; it marched hundreds of miles, and was in nineteen battles, and 169 of its men were killed. 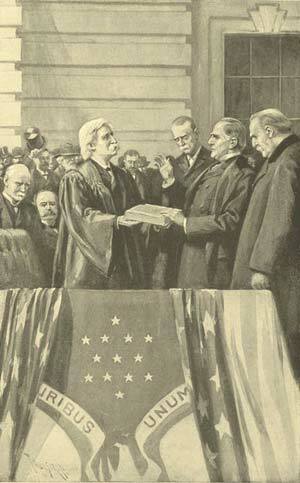 President Mckinley taking the oath of office. Young McKinley was one of the model soldiers of the regiment. General Hayes said: "We soon found that in business and executive ability he was of unusual and surpassing capacity for a boy of his age. When battles were to be fought, or a service was to be performed in warlike things, he always took his place." McKinley said in after years that he looked back with pleasure upon the fourteen months that he carried a musket in the ranks, for they taught him many things. The regiment was sent into West Virginia, and its first engagement was at Carnifex Ferry. In the summer of 1862 it was ordered to Washington, and a few days after its arrival it joined the Army of the Potomac, which was then moving northward to head off the Army of Northern Virginia, which was bent upon an invasion of the Northern States. The crash of arms came at South Mountain (September 14th) and Antietam (September 17th). At South Mountain the regiment made three successful charges, and lost heavily. Antietam was the bloodiest day of the war, more than 2,000 men on each side were killed on the field, and the Twenty-third Ohio was in the hottest of the fight, holding its position from morning till evening unrelieved. Private McKinley, meanwhile, had been made Commissary Sergeant, and his place was with the supplies in the rear. He pressed a few stragglers into his service and got ready a dinner for the regiment, with hot coffee, and loaded it into two wagons. With these he drove upon the field, under fire. The enemy's shot struck down the mules of one wagon, but with the other he reached his comrades on the firing-line, who gave a great shout of welcome when they saw him. He walked along the line, and fed every man with his own hand. There is no record that such a thing ever was done before or since. For this service he was made a second lieutenant, and in the following February he was promoted to first lieutenant. The regiment was a part of the force that headed off Morgan in his raid into Ohio, fought him at Buffington's Ford, and finally captured him. After that it took part in a series of battles in the mountains and in the Shenandoah Valley. At Cloyd's Mountain, after a wonderful march through ravines and dense woods, they burst into the enemy's camp, McKinley leading his company, which was the first to leap over the fortifications and silence the guns. At Winchester, in July, 1864, General Crook's army of 6,000 men was attacked by Early's of 20,000 and compelled to retreat. A West Virginia regiment failed to fall back with the rest, and Lieutenant McKinley was ordered to bring it off. Major Hastings says: "None of us expected to see him again as we watched him push his horse through the open fields. Once he was completely enveloped in the smoke of an exploding shell." He brought off the regiment and led it to its place in the marching column. And a little later he found opportunity to perform another peculiar service. As they continued their retreat down the valley, they came upon four guns, with caissons, that had been abandoned. Lieutenant McKinley asked for permission to bring them off, and received it, though his superior officers would not order the tired men to undertake the task. "I think the Twenty-third will do it," said the young lieutenant, and when he called for volunteers every man in his company came forward and the guns were saved. The next day he was promoted to captain. He again distinguished himself in the battles of Berryville, Fisher's Hill, and Opequan. He was now on General Crook's staff, and at the bloody battle of the Opequan occurred an incident that showed the young officer capable of becoming a successful commander. He was sent with an order to General Duval to move his brigade to a position on the right of the Sixth Corps. The General asked, "By what route?" and the Captain suggested, "I would move up this creek." The General, ignorant of the ground, refused to move without definite orders. "Then," said McKinley, who knew that there was urgent need of the movement, "by command of General Crook, I order you to move your command up this ravine to a position on the right of the army." The movement was made at once, and proved successful. McKinley was also in the fierce fight at Cedar Creek, and afterward served on Hancock's staff. In March, 1865, he received from President Lincoln a commission as Major by brevet for gallant services. With so much of manly character developed at the age of twenty-two, and so much experience in the greatest conflict of modern times, he turned to the study of law--first in an office, and then in the Albany Law School--and was admitted to the Bar in 1867. He settled in Canton, which was thenceforth his home, and there in 1871 he married Miss Ida Saxton, who was cashier in her father's bank. Their devotion for thirty years, and the tenderness and constancy with which he watched over her in the latter years when she was an invalid, form a chapter that never can be mentioned without touching the hearts of their countrymen. Mr. McKinley made his first political speech in 1867, and in 1869, as a Republican, was elected prosecuting attorney for Stark County. In 1875 he made effective speeches for honest money and the resumption of specie payments, and in 1876 he was elected to Congress by a large majority. He was re-elected six times, but in 1890 was defeated by the gerrymandering of his district. In 1891 he was nominated for Governor of Ohio, and was elected by a plurality of 21,500. He was re-elected in 1893 by a plurality of more than 80,000. In Congress he had been a prominent debater on many important questions, but he was chiefly conspicuous as an advocate of protection, and, as Chairman of the Committee of Ways and Means, he was largely the author of the tariff bill of 1890 which bears his name. It was slow work getting the bill through Congress, and it did not become a law till October. The most amazing misrepresentations of it were set afloat, and it had not time to vindicate itself before the Congressional elections came on in November, when the party that had carried it through was overwhelmingly defeated. During these years Mr. McKinley was almost constantly in the field as a political speaker, and he became known as one of the most popular and effective that our country has produced. It is computed that he addressed a larger number of men, from the platform, than any other man that ever lived. He was a delegate to several national conventions of his party, and in 1888, and again in 1892, there was a strong movement to give him the presidential nomination; but he decisively suppressed it each time--on the first occasion because he had gone there as a friend and supporter of John Sherman, and on the second because he declared that President Harrison was entitled to a renomination. In 1896 he was unanimously nominated on the first ballot. One circumstance that pointed him out as the logical candidate was the fact that his tariff bill had been replaced by one that proved a complete failure. The most exciting question in the canvass was that of free coinage of silver. Mr. McKinley was on a platform that declared for the gold standard, and his opponent, William J. Bryan, was on one that declared for free and unlimited coinage of silver at the ratio of sixteen to one. Mr. McKinley was elected by a plurality in the popular vote of more than 600,000, and in the electoral college by 271 to 176. In 1900 he was renominated, and his opponent as before was Mr. Bryan, the issues being the same. This time Mr. McKinley had a plurality in the popular vote of more than 800,000, and in the electoral college had 292 to 155. 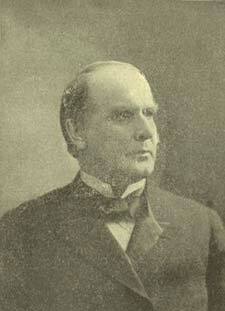 In the canvass of 1896 Mr. McKinley announced that he would make no electioneering tour. But the people were determined to hear him, and they went to Canton in large delegations and excursions from all parts of the country. From his doorstep he made more than three hundred addresses, speaking thus to three-quarters of a million persons. There was scarcely any repetition, yet every speech was an admirable specimen of argument and oratory. Immediately after his first inauguration he called a special session of Congress to revise the tariff, and the new bill was put through in time to have a fair chance to vindicate itself before new elections occurred. The other notable event in the first year of his administration was the treaty for annexation of the Hawaiian Islands, which he signed in June, but which was not confirmed by the Senate till a year later. In 1898 occurred the most important event in American affairs since the Civil War--the war with Spain. This arose from the intolerable condition of things in Cuba, where the Spanish authorities, endeavoring to suppress the last of many insurrections, had resorted to the most cruel measures, which entailed horrible suffering upon the women and children, and the feeling was intensified by the blowing up of the battleship Maine in the harbor of Havana, February 15, 1898. President McKinley did his utmost to prevent actual war; and when he saw that to be inevitable, he delayed it as long as possible and pushed on the preparations for it with all practicable speed. On April 11th he sent to Congress a message on the subject, and on the 20th he signed a joint resolution declaring that the people of Cuba ought to be free and independent, and demanding that the Government of Spain relinquish its authority over that island. Diplomatic relations were broken off at once, and a state of war was declared. Ten days later an American fleet commanded by Commodore George Dewey entered the harbor of Manila, destroyed a Spanish fleet, and silenced the shore batteries, without losing a vessel or a man. On July 3d another American fleet destroyed another Spanish fleet that had run out of the harbor of Santiago, Cuba, and was trying to escape westward. In this action, again, the Americans lost not a single vessel, and but one man. Two days earlier than this the American land forces that had been approaching the defences of Santiago on the east advanced to the final assault, and after bloody fighting at San Juan Hill and El Caney they were victorious. The invasion and capture of the island of Porto Rico, soon afterward, ended the war in the West Indies. In August the American land forces that had been sent to the Philippines captured the city of Manila and its garrison. Peace soon followed, and by the treaty signed in Paris, December 10th, Spain relinquished her sovereignty over Cuba and ceded to the United States Porto Rico and the Philippines, receiving $20,000,000 as an indemnity for her expenditures in the last-named islands. President McKinley travelled extensively during his term of office, spoke many times in nearly every State, and was probably more generally beloved by the people than any of his predecessors. He visited the Pan-American Exposition at Buffalo, in September, 1901, and on the 5th delivered a notable speech, which was admired and commented upon all over the world. The next day, when he was holding a reception in the Temple of Music on the Exposition grounds, he was treacherously shot by an anarchist and wounded so that, in spite of the immediate services of the most skilful surgeons, he died on the 14th. His amiable and dignified character was conspicuous to the last. When he saw the crowd about to kill the assassin on the spot, he exclaimed: "Let no one hurt him!" To the surgeons he said: "I wish you to do whatever in your judgment is best." When his last hour came he was heard softly chanting his favorite hymns--"Nearer, my God, to Thee" and "Abide with me," and his last words were, "It is God's way--His will be done. Good-by all--good-by!" Thus passed away this wonderful man, this model American, worthy of a place in history beside Washington and Lincoln. He had fought like a hero--he had wrought like a genius--he had lived like a patriot--he died like a philosopher.